Today's piece was kindly contributed to our collection by its composer, Paul Merkus from the Netherlands. The piece is titled “Rengaine”, which is French for “simple tune” or “ditty”. This designation is an appropriate title as the piece actually opens with a very simple melody (semplice), but on the other hand it is also a euphemism, because after the easy opening tune there is definitely more to follow. What follows is a variation on the theme with a rich embellishment in the flute and more activity in the piano accompaniment, evolving into a more dance-like part (giocoso) which is then brought to rest by a brief interlude. In a somewhat slower pace (meno mosso) a more lyrical second theme follows, initially established in minor with a plain piano accompaniment, then returning in a major variation above a more agile piano part (animato). This results in a highlight for the flute over a marcato driving bass line (agitato), after which the flute comes to rest. The piano then gets a chance to show off in a sumptuous interlude (maestoso) which is followed by an embellishment of this new theme played by the flute as if it were intoxicated (intontito). 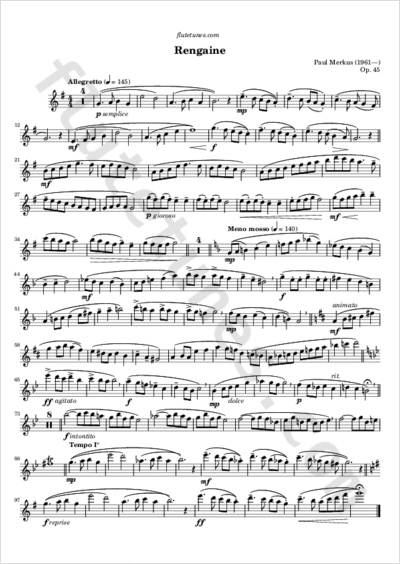 After a final trill (like in a cadenza), we return to the opening theme, at first in minor, then repeated by the flute in the more familiar major form (reprise), but this time in the upper octave in order to achieve a brilliant conclusion.